Employee engagement is important for every employee, your desk-based and deskless workers alike. Employees who understand the cause of the organization are always more satisfied and more motivated with their workplace. That's why its so important to communicate directly with every employee and provide an environment where people feel connected, even your remote workers. 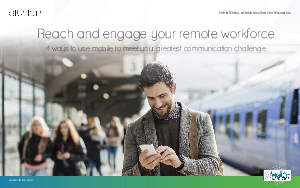 No platform is better suited to support employee engagement than mobile. Smartphones are not only a tool for communication but an extension of self. Reach employees where they are, no matter where they are located. You‘ll have the two-way communication you need for engagement, employee participation, and corporate reach.